Qadri Jamil, one of the leaders of Moscow-Cairo opposition group, said that representatives of the Syrian opposition met Russian Foreign Minister Sergei Lavrov on Monday to discuss ways to find consensus on political transition at the intra-Syrian talks. 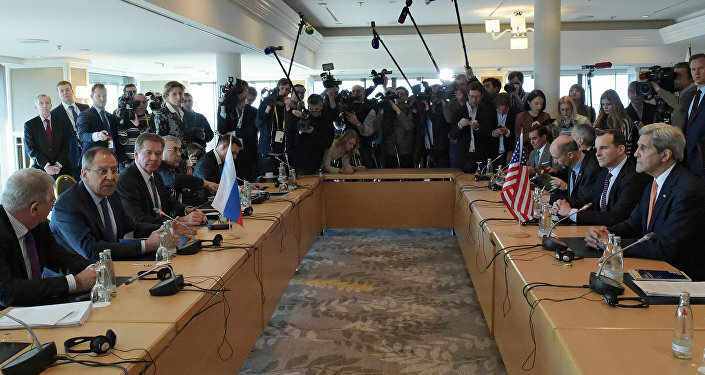 VIENNA (Sputnik) – Representatives of the Syrian opposition met Russian Foreign Minister Sergei Lavrov on Monday to discuss ways to find consensus on political transition at the intra-Syrian talks, Qadri Jamil, one of the leaders of Moscow-Cairo opposition group, told Sputnik. "We spoke about how to speed up Geneva process and find ways of reaching consensus on the political transition and primarily composition of the transitional governing body," Jamil said after the meeting. Jamil, the leader of Astana platform in Moscow-Cairo group, Randa Kassis, representative of Hmeimim group Ilian Masaad and European representative of the Kurdish Democratic Union Party (PYD) Khaled Issa held the talks with Lavrov ahead of the International Syria Support Group (ISSG) meeting scheduled for Tuesday. On Sunday, a source at the intra-Syrian talks told Sputnik, the ISSG would most likely make concrete decisions on the composition of the Syrian transitional governing body at the upcoming meeting in Vienna.